"The Proposal Proposal" - Pictured: Rajesh Koothrappali (Kunal Nayyar), Sheldon Cooper (Jim Parsons), Leonard Hofstadter (Johnny Galecki) and Howard Wolowitz (Simon Helberg). 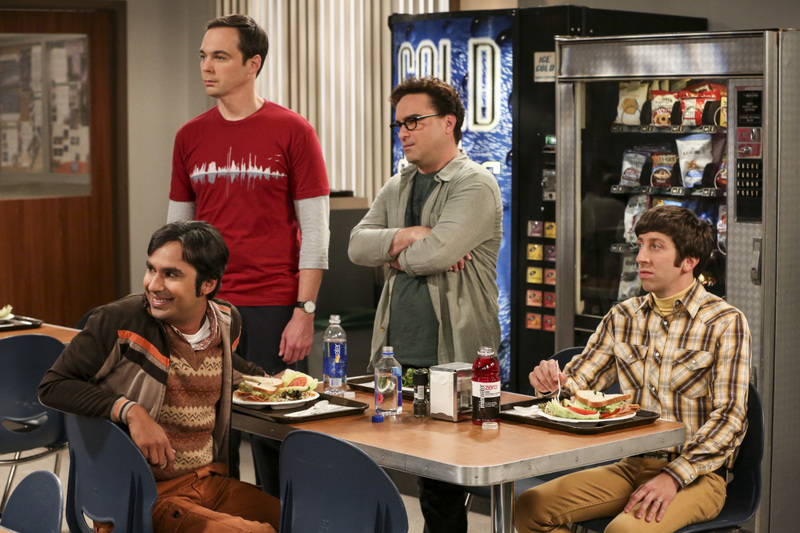 Amy gives Sheldon an answer to his proposal while Howard and Bernadette struggle with some unexpected news, on the 11th season premiere of THE BIG BANG THEORY, Monday, Sept. 25 (8:00-8:30 PM, ET/PT) on the CBS Television Network. Laurie Metcalf returns as Sheldon--ÃÂ¡Ã¢ÂÂ¢ÃÂ "--ÃÂÃÂ "ÃÂ¢'s mother, Mary; Riki Lindhome returns as Ramona; and Stephen Hawking returns as himself. Photo: Michael Yarish/Warner Bros. Entertainment Inc. ÃÂ 'ÃÂÃÂ¬ÃÂ 'ÃÂÃÂ© 2017 WBEI. All rights reserved.